I use notebooks for work and personal notes and sketches. I’ve given up on the dream of condensing it all down to a pocket notebook size that is always in my pocket with my phone, so I’ve been using larger-sized notebooks for several months and really liking it. My perfect notebook would be A5 (or thereabout), have a dot grid, have page numbers, and have paper that is smooth to write on, doesn’t feather, and has no bleed through with heavy ink application (like super wet vintage flexies). The Leuchtturm1917 comes pretty close to this, but the paper doesn’t quite hold up to ink abuse from fountain pens. The paper in the Clairefontaine books (and others that use their paper like Rhodia, Wuo Vadis, etc.) 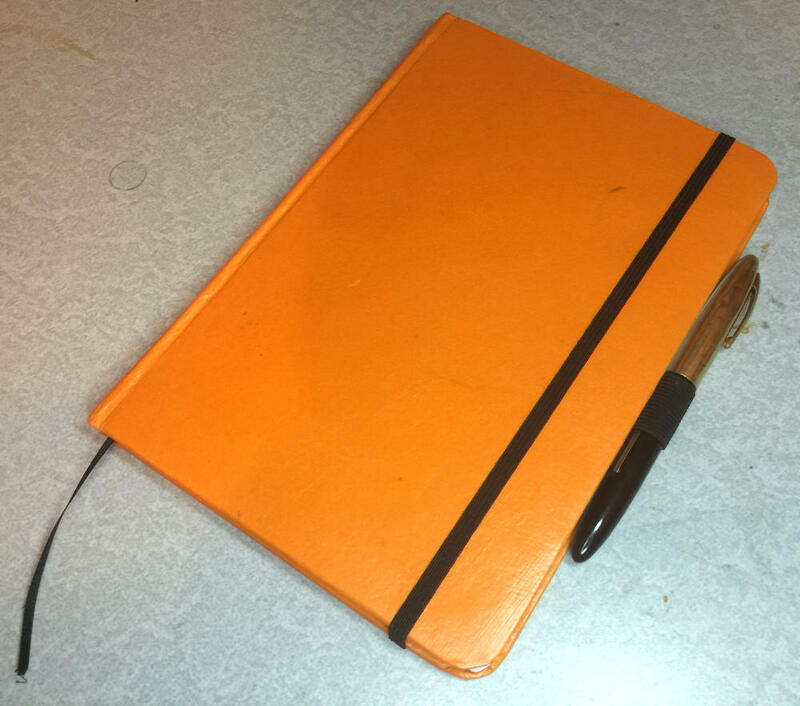 is a delight to write on, but none of the notebooks are quite meet my other requirements. For the last year or so I’ve been binding books as an occasional hobby, so I’ve been using that to play around with making my own notebooks. The biggest concern is, of course, the paper that I use for it. I first used Step Forward paper. This paper is absolutely awesome with fountain pens. No feathering; no bleeding; it’s great. After using it for quite awhile though, I decided that the paper had more tooth than I wanted. So a couple weeks ago I went looking for new paper again an ran across this Clairefontaine DCP This paper bleeds a little bit with super wet ink action but otherwise it is just as wonderful as the paper you’d find in the notebooks. At some point I’d like to publish a full-on tutorial on how to do this, but for now I thought I’d at least share a list of what I used to created (including the tutorials where I learned book binding). Book binding tutorials from Sage Reynolds—This was how I first got into book binding. Notebook binding tutorial—this is the method I’ve been using lately for sewing the signatures together and binding it. The remaining materials all come from the local Hobby Lobby craft store: cover boards (comes in a 20×30 sheet), cover stock (used to wrap around the cover boards), fabric to reinforce the spine, silk ribbon as a marker, 1/4” elastic for the closure strap, 1” elastic for the pen loop, heavier paper for the end papers, sewing needle and heavy thread, and tacky glue. Layout file for dot-grid and page numbers—This is a PDF download of a layout I created this layout in Adobe InDesign. It’s got a 5.5mm dot grid. (You may need to right-click the link to save the file to your local drive). The layout file is put together so all you need to do is print it front-to-back (duplex) and fold every four pages. You’ll know you’re doing it right because when you fold it, the inside pages will be facing page numbers (in the first signature, pages 6 & 7 are facing each other. There’s a blank sheet at the beginning and end of the book to attach the end papers to. I should note that the layout file is intended to be the cover the full A4 sheet of paper. If you fold the signatures in half then you’ll have a full A5 notebook, however the paper edge will be uneven. If this unevenness bothers you, there should be enough of a margin to trim it slightly.